Funny old street is Fore Street, home to such diverse elements as the slipper baths, A Passage To India and the Co-op Education Centre. If you need an LP, head to Out Of Time Records. If you need an MP, head to Gummer Jr's office. You want art? That Cor Visser was 'ere. Down a bit from Martin & Newby's and opposite the Indian is a distinctive shopfront numbered 14-20. Was Sneezum's photographic for yonks. More recently a Thai restaurant, Top Banana, et cetera. 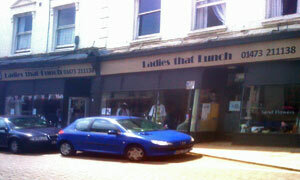 Now it's Ladies That Lunch, a new "shopping experience" for female ladies. Professionally, we're less interested in the outfits and more keen on the bolted-on cafe next door. We'll take the seat in the window, thanks. Inside are various mismatched tables like some sort of pop-up eatery. Fentiman's Curiosity Cola on the way, it's time to examine the laminated menu. Again, there's no great sense of style or harmony. Hot bacon baguette for me (comes with mini salad and ketchup) and a full English for Andy, a growing lad. When it comes, his classy oblong plate is a work of art and very well presented. Ditto his tea in a cute square china cup on a right-angled saucer. Such an odd mix of the ramshackle and the rarefied. His belly still distended by last week's blow-out at Arlingtons, Andy goes for the cream tea. Does he get fed at home? OK chocolate cake for me and a posh cup of good coffee. Not sure about the decor but thumbs up for the food and service at LTL. If it was a car -- FAB1. If they were passing by -- Julia Sawalha.